A large range of GME radios available in store! We can progam them for you as well! Enquire now! In today’s modern times communication is near the top of the list when it comes to the health and safety of us all. We need to be able to communicate hazards, problems and instructions to ensure the well-being of work colleagues, family and friends. That’s why Wrack Auto provides you with high quality GME radios products. GME began in the early 1950’s. GME has become a market leader within the radio communication industry in Australia and New Zealand and is well known and respected within the trucking community. GME also have one of the best ranges of recreational radios on the market in New Zealand today. Check out our marine batteries here and if you ever get in trouble, we’ve got you covered – 24/7 Call-out Service! We have a large range of GME fixed mount radios available. There are a number of different styles and mounting options: in dash din fit, on dash, under dash and window suction cup mount. With such a large range of GME radios being available we have more than likely got your needs covered. 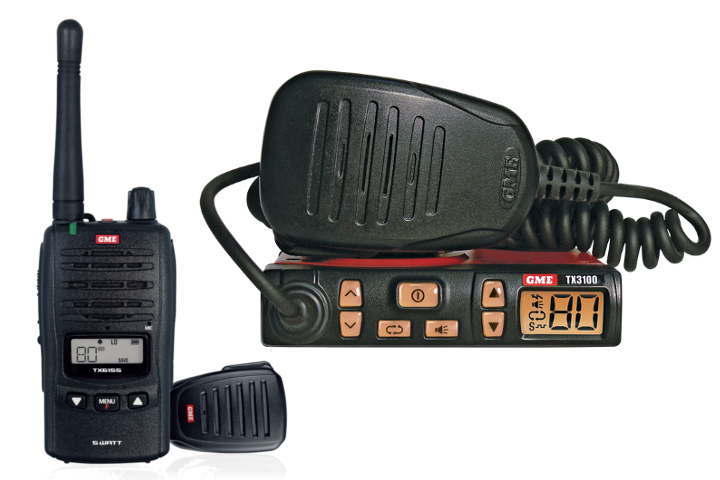 Our GME radios are used in trucking, agriculture, contracting, saw mill, quarries, off road 4 wheel driving and more. Any questions or want to know more, give us a call! More models available, a quick call and we will sort it for you! GME has also a small range of bush radios available. We have in dash, on or under dash mount units available, which we are ready to install for you. Being a bush radio, they will need to be dealer programmed. We are happy to do this for you! We also have a great little hand held unit available from another brand, which is a dual channel watch. We have a great selection of hand held radios in stock. The range is from small in size and power output to large units and full power (5watts). We have water resistant units (IP67) available. Hand held radios are ideal for tramping, farming, hunting, off-roading, sawmills and much much more.